Home / Travel and Living / How to go inside Matrimandir inner chamber, Auroville? How to go inside Matrimandir inner chamber, Auroville? Almost every website that lists “top places to visit in Pondicherry” mentions Auroville. Auroville is popular for its Matrimandir- a gold coloured spherical dome meant for meditation. Viewing Matrimandir from outside (from viewing point) is fine but not getting to go any closer spoils the experience. But what these websites don’t explain is how to go inside Matrimandir. An unplanned visitor/tourist visiting Auroville only gets to see the Matrimandir from outside,from a distance of few hundred meters. Getting to go closer and inside is a bit more complicated process that takes some time and effort. During my first visit to Pondicherry several years ago I went to Auroville and saw the Matrimandir from outside. From the initial inquires I had figured out that getting to go inside is a multi day process – we have to get a pass first and go next day. But all my subsequent Pondy visits were just day trips. Couldn’t afford this 2 day process, which needs to be done in person at auroville at designated time and can’t be done online. Thus the experience of going inside the inner chamber of Matrimandir was long overview. Finally, last weekend, I planned a trip to Pondicherry with overnight stay and hence could afford to go inside Matrimandir. The information on how to go inside Matrimandir wasn’t very easily accessible. Of course official website has the details, but no easy way to get any additional inputs/clarifications. 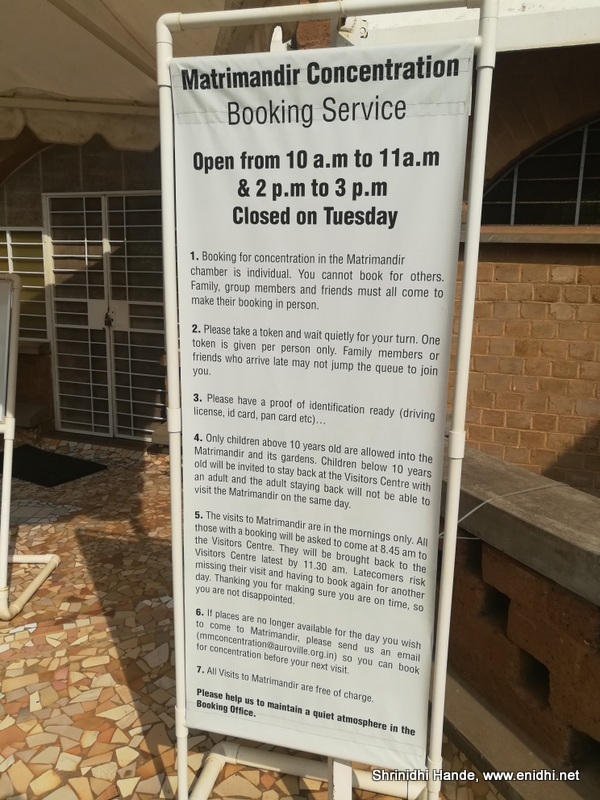 In this post, I am explaining detailed process of getting access to inner chamber of Auroville’s Matrimandir based on my first-hand experience last weekend. The actual experience of going inside Matrimandir will be explained in a separate post. How to get a pass to go inside Matrimandir’s inner chamber? First time visitors who wish to go inside Matrimandir must visit Auroville’s visitor information centre in person at least 1 day in advance. Thus visiting Matrimandir’s inside chamber is only possible if you’re in Pondicherry for at least 2 days. Preferably more. Each individual who wish to go inside Matrimandir should go in person- it is not possible for one family member to go and get pass for everyone in family. It is not possible for tour operators to get you passes. 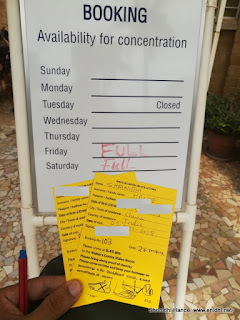 It is not possible for a resident or volunteer or your hotel in Pondicherry to get you passes. Every individual should go on their own. Also do carry an ID Proof. Pass to enter Auroville’s Matrimandir inner chamber are issued between 10 to 11 AM, 2 to 3PM. This pass issuing counter is open on all days except Tuesday. The passes are issued only for next day or next available day, max upto 1 week. I doubt if visitors can have an option of selecting a date- you’re expected to accept next available slot. Days that are sold out is shown on a white board near the entrance. How many passes are issued per day to visit Matrimandir inner chamber? The exact number, current availability etc are NOT displayed anywhere, so the outsiders can’t know these numbers. On the day I went to get the pass, there were about 30-50 people. Next day when we went for actual visit, some 150-200 people were there- some of them could be repeat visitors who don’t have to appear in person, others would have got their pass after we left on Saturday. The actual process & experience of collecting entry pass to Matrimandir’s inner chamber. Knowing that there could be large queue, I visited Matrimandir visitor centre at around 8.45 AM on Saturday. Upon asking around, I was guided to first floor of the building that was exactly opposite the video room. Once I went up, I saw that display announcing timing of 10-11 AM and 2-3 PM. The display said entry is full for Friday & Saturday- which meant for Sunday, the next day, there were availability. Now I had two choices- go around, come back at 10 AM or wait there. Though there were no one else at around 8.50 AM, I chose to sit near the door and read a book, officially positioning myself in first position in what might develop as a long queue. Another 1 hour about 10-20 people joined the queue. Exactly 10 AM some volunteers came in and opened the doors. The crowd had swelled to about 30-50 by now. Though the instructions said everyone will be given a token and we’ve to wait for our turn, once door the doors opened everyone were let in and asked to take a seat. 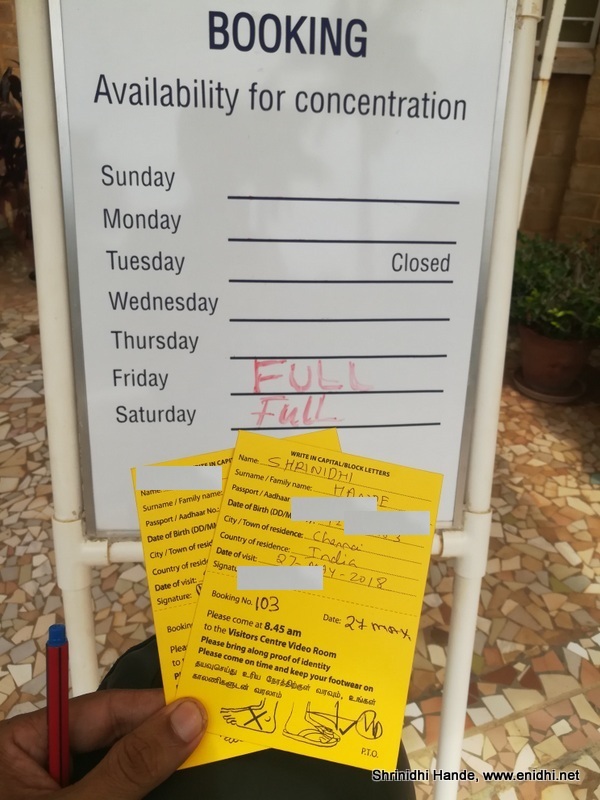 No tokens were issued- my guess is this was because volunteers felt that everyone will get a chance as there were more passes than no of people waiting. We were given a yellow colour pass on which we had to write our name, ID details and date of entry (next day). A volunteer checked our entry, signed on the pass and asked us to come next day 8.45 AM sharp. This whole process of getting the pass was over in within 10 mins of door opening. We were free to leave. The next day experience of visiting Matrimandir’s inner chamber will be coming up in a separate post. Children below 5 years are not allowed inside Matrimandir’s inner chamber. If you have a child, then one parent/caretaker will have to stay back, forgoing their own opportunity to go inside. So if you’re going with a kid either plan such that one parent goes in on day 02, another on day 03, or take a 3rd person who will stay back with the kid. Visitor pass to go inside Matrimandir’s inner chamber is issued between 10-11 AM, 2 to 3 PM on all days except Tuesday. Each individual should go in person- no group booking, no booking for others. Kids below 5 years are not allowed inside. If you can't reach Auroville visitor information centre by 8.45 AM, you lose your chance and have to repeat the process again. So keep some buffer and reach on time. I visit Pondicherry every year, since my sister stays there. But I have never attempted to visit inside the matrimandir. This post is encouraging me to have the experience this July since I am visiting again. Very Informative!